Welcome to the OSU Mini Malter Design & Construction website. This website was put together with two purposes in mind; 1) to allow collaboration between all involved in the project and 2) to showcase the project to those not involved. The website is currently broken into four parts: Research, Design, The Build and Reports. The research tab and everything below it contain information compiled through talking with the project sponsors, outside companies, and information gathered through various resources. 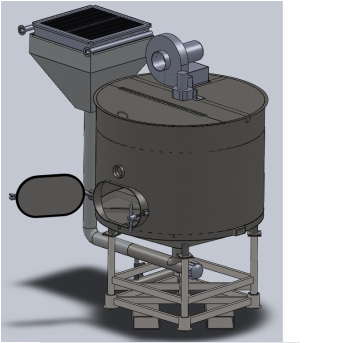 The customer requirements tab lays out all the requirements that the mini malter must fulfill. The design tab and everything below contains drawings, explanations, and solid modeling of our final design. This shows the progression of the design process, from three dissimilar designs to one final design which we feel meets the customers needs. The build tab contains information on the build process and testing. Check here for photo updates of the project. The bill of materials contains information about and the cost of all parts ordered. The report tab contains all the information in the previous three tabs in a concise, easy to read format. The latest report is placed at the top of the page with the last updated date. The misc. documents tab contain documents that don't fit anywhere else. It's use is primarily for those involved in the project. All original content on the website is the intellectual property of Oregon State University. All original images, sketches, and words are copyright Oregon State University. By reading the information on this website you agree that you will not steal, modify, or reproduce any original content.